What is Holy Week and what happens during this time? This weekend we move into Holy Week, the most sacred part of the Liturgical year. The final week of preparation before Easter Sunday, these days recount Christ’s final days on earth. Though we’ve been preparing for Christ’s death and resurrection all through Lent, our preparation becomes even more focused during this short time. There’s so much that goes on during Holy Week, we thought a guide to the special traditions and liturgies would be useful. Also called Passion Sunday, it is the Sunday before Easter. Palms are distributed as a reminder of Christ’s triumphant entry into Jerusalem.​ ​We remember Christ’s triumphant entry into Jerusalem, which the Gospels place as happening about a week before his Passion. On Wednesday of Holy Week, we remember Judas’s betrayal of Jesus – when he sold his friend and teacher for 30 pieces of silver. There’s no liturgical custom for this dark day, but Judas’s betrayal directly leads to Jesus’ being taken into custody, followed by the way of the Cross, and ultimately the crucifixion – all for 30 pieces of silver. Judas eventually regrets his betrayal of Jesus. He returned the silver. However, Judas despaired and ultimately did not have faith in Jesus’ forgiveness. 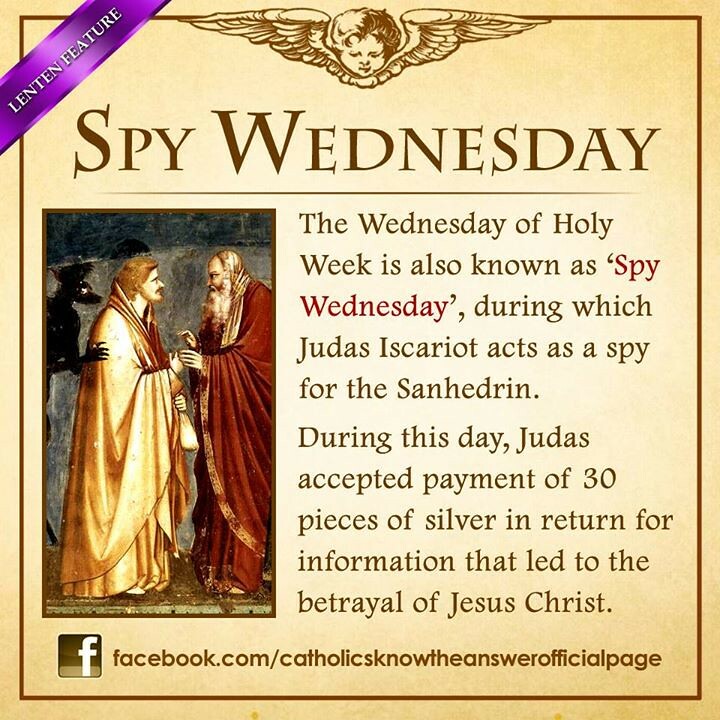 Spy Wednesday reminds us that we too sell out Jesus. But take heart – because Jesus saves us from that very sin. What is the oil of Chrism made from? Traditionally, the oil consists of a mixture of olive oil and balsam, however, if necessary, holy oils may be from any plant and not only from olives. What is the Easter Triduum and when does Lent end? It is at this special celebration that we remember and celebrate Jesus’ gift of the Eucharist. It is the night when we renew our mandate to serve one another in the washing of the feet, which first took place at the Last Supper. Good Friday is the day that we recognize as the day that Jesus died on the cross. Commemorates the period where Jesus’ body lay in the tomb. As on Good Friday, no Mass is celebrated on Saturday of Holy Week. On this day we meditate on Jesus’ death in mourning, emphasising with his disciples who had just buried him the night before. Though we know the story has a happy ending, we meditate on his absence, grieve his suffering and entry into Hell, and watch for his resurrection. On the evening of Holy Saturday, both the Triduum and Holy Week conclude with the Vigil of the Lord’s Resurrection. Easter begins with the Easter Vigil – during these services, catechumens (those preparing to join the Catholic Church) are baptised and brought into full Communion with the Catholic Church. What is Easter Sunday and how does it differ from the Easter Season? Easter Sunday is the day when Catholics celebrate Christ’s resurrection from the dead. The Easter Season totals 50 days – Easter Sunday to Pentecost Sunday. The Easter Season is a time for reflection on and deepening of our awareness of the mysteries prepared for in Lent and celebrated at the Triduum.